The Times-Picayune is an American newspaper published in New Orleans, Louisiana, since January 25, 1837. The current publication is the result of the 1914 merger of The Picayune with the Times-Democrat; and was printed on a daily basis until October 2012, when it went to a Wednesday/Friday/Sunday schedule. However, under competitive pressure from a new New Orleans edition of The Advocate (based in Baton Rouge), the Times-Picayune resumed daily publication in 2014. The paper and the NOLA.com website form the NOLA Media Group division of Advance Publications. 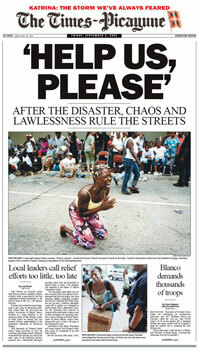 The paper was awarded the Pulitzer Prize for Public Service in 2006 for its coverage of Hurricane Katrina. Four of The Times-Picayune’s staff reporters also received Pulitzers for breaking-news reporting for their coverage of the storm. The paper funds the Edgar A. Poe Award for journalistic excellence, which is presented annually by the White House Correspondents' Association. Established as The Picayune in 1837 by Francis Lumsden and George Wilkins Kendall, the paper's initial price was one picayune, a Spanish coin equivalent to 6¼¢ (half a bit, or one-sixteenth of a dollar). Under Eliza Jane Nicholson, who inherited the struggling paper when her husband died in 1876, the Picayune introduced innovations such as society reporting (known as the "Society Bee" columns), children's pages, and the first women's advice column, which was written by Dorothy Dix. Between 1880 and 1890, the paper more than tripled its circulation. The paper became The Times-Picayune after merging in 1914 with its rival, the New Orleans Times-Democrat. In 1962, Samuel Irving Newhouse, Sr., bought the morning daily The Times-Picayune and the other remaining New Orleans daily, the afternoon States-Item. The papers were merged on June 2, 1980 and were known as The Times-Picayune/States-Item (except on Sundays; the States-Item did not publish a Sunday edition) until September 30, 1986. In addition to the flagship paper, specific community editions of the newspaper are also circulated and retain the Picayune name, such as the Gretna Picayune for nearby Gretna, Louisiana. The paper is a part of Advance Publications, which is owned by the Newhouse family, and is operated through Advance's NOLA Media Group unit along with its sister website, NOLA.com. Hurricane Katrina became a significant part of the newspaper's history, not only during the storm and its immediate aftermath, but for years afterward in repercussions and editorials. As Hurricane Katrina approached on Sunday, August 28, 2005, dozens of the newspaper's staffers who opted not to evacuate rode out the storm in their office building, sleeping in sleeping bags and on air mattresses. Holed up in a small, sweltering interior office space—the photography department—outfitted as a "hurricane bunker," the newspaper staffers and staffers from the paper's affiliated website, NOLA.com, posted continual updates on the internet until the building was evacuated on August 30. With electrical outages leaving the presses out of commission after the storm, newspaper and web staffers produced a "newspaper" in electronic PDF format. On NOLA.com, meanwhile, tens of thousands of evacuated New Orleans and Gulf Coast residents began using the site's forums and blogs, posting pleas for help, offering aid, and directing rescuers. NOLA's nurturing of so-called citizen journalism on a massive scale was hailed by many journalism experts as a watershed, while a number of agencies credited the site with leading to life-saving rescues and reunions of scattered victims after the storm. After deciding to evacuate on Tuesday, August 30, because of rising floodwaters and possible security threats, the newspaper and web staff set up operations at The Houma Courier and in Baton Rouge, on the Louisiana State University campus. A small team of reporters and photographers volunteered to stay behind in New Orleans to report from the inside on the city's struggle, looting, and desperation. They armed themselves for security and worked out of a private residence. After three days of online-only publication, the paper began printing again, first in Houma, La., and beginning September 15, 2005, in Mobile, Ala.; it resumed publication in New Orleans on October 10, 2005. The paper was awarded the Pulitzer Prize for Public Service in 2006 for its coverage of the storm, and four of its staff reporters also received the award for breaking news reporting for their coverage of Hurricane Katrina, marking the first time a Pulitzer had been awarded for online journalism. For us, Katrina is and will be a defining moment of our lives, a story we'll be telling till the day we die. Being a part of the plot is both riveting and deeply unsettling. We don't yet know the end of this story ... It's the story of our lives, and we must both live and chronicle it. On May 24, 2012, the paper's owner, Advance Publications, announced that the print edition of the Times-Picayune would be published three days a week (Wednesday, Friday, and Sunday) beginning at the end of September. News of the change was first revealed the night before in a blog post by New York Times media writer David Carr. A new company, NOLA Media Group, was created to oversee both the paper and its website, NOLA.com. Along with the change in its printing schedule, Advance also announced that significant cuts would be coming to the newsroom and staff of the Picayune. A second new company, Advance Central Services Louisiana, was created to print and deliver the newspaper. The decision to end daily circulation led to protests calling for continued publication for the common good; fifty local businesses wrote an open letter to the Newhouse family, urging them to sell the paper instead, since they had stated it was still profitable. An ad hoc group of community institutions and civic leaders, The Times-Picayune Citizens Group, was formed to seek alternatives for the continued daily publication of the newspaper. In October 2012, The Times-Picayune began publishing its broadsheet paper on Wednesdays, Fridays, and Sundays. Along with the change, the paper began publishing a special tabloid-sized edition following Sunday and Monday New Orleans Saints football games and an "early" Sunday broadsheet edition, available on Saturdays. The thrice-weekly publication schedule made New Orleans the largest American city not to have a daily newspaper, until The Advocate of Baton Rouge began publishing a New Orleans edition each day to fill the perceived gap. On June 12, 2012, Advance followed through with its layoff plans, as about 200 Times-Picayune employees (including almost half of the newsroom staff) were notified that they would lose their jobs. In April 2018, NOLA Media Group moved from the offices at One Canal Place to a newly renovated location at 201 St. Joseph Street, New Orleans. Its news staff, sales and sales support staff, marketing, and other administrative staff now work from the Warehouse District offices, offices in St. Tammany Parish at 500 River Highlands Blvd., Covington, and the existing East Jefferson Times Picayune Bureau at 4013 N Interstate 10 Service Road W, Metairie. On April 30, 2013, the paper's publisher announced plans to print a tabloid version of The Times-Picayune, called Times-Picayune Street, on Mondays, Tuesdays, and Thursdays, sold only through newsstands and retail locations. The move returned the paper to a daily printing schedule (including the "early" Sunday edition offered at newsstands on Saturdays). The TP Street edition first went on sale Monday, June 24, 2013. The new edition removed from New Orleans the designation as the largest city in the United States without its own daily newspaper; with The Times-Picayune, along with the New Orleans edition of The Advocate, the city now has two. However, in reporting its print circulation figures to the Alliance for Audited Media, The Times-Picayune still provides data only for the home-delivery days of Sunday, Wednesday, and Friday. The paper returned to a full broadsheet format on September 6, 2014, for all editions and ceased using the "TP Street" name. On the same date, NOLA Media Group began publishing "bonus" editions of The Times-Picayune on Saturdays and Mondays to be home-delivered to all three-day subscribers at no additional cost. The bonus editions were delivered for 17 weeks, the duration of the 2014 football season. On January 3, 2015, NOLA Media Group returned the paper to its previous three-day home delivery, printing two-section papers for street sales only on the other four days. On Saturday, February 13, 2016, NOLA Media Group debuted a street-sales only "Early Sunday" edition, a hybrid of features from the former Saturday street-sales only paper and sections from the Sunday paper, offered at the Sunday price. On October 21, 2014, the paper announced it would begin printing and packaging The Times-Picayune in Mobile, Ala., sometime in late 2015 or early 2016, closing the plant on Howard Avenue in New Orleans and eliminating more than 100 jobs at Advance Central Services Louisiana. The Howard Avenue building, which housed all aspects of the newspaper operation, opened in 1968. The building's lobby is lined with custom panels by sculptor Enrique Alferez showing symbols used in communication throughout history. Although NOLA Media Group said in 2014 that it hoped to donate the building to a nonprofit institution in the community, it ultimately sold the building September 2, 2016, to a local investor group for $3.5 million. The newspaper of Sunday, January 17, 2016, was the last Times-Picayune to be printed in New Orleans. The street-sales-only newspaper of Monday, January 18, 2016, was the first to be printed in Mobile. The New Orleans presses were to be decommissioned. The circulation numbers for the printed Times-Picayune were the largest of any newspaper in Louisiana until the end of 2014. By then, declines in its sales, combined with circulation gains by The Advocate, dropped The Times-Picayune to second place behind The Advocate. NOLA Media Group announced on June 15, 2015, that it would join with Alabama Media Group in a new regional media company across Louisiana, Alabama and Mississippi, to be called Southeast Regional Media Group. Additional job losses were expected in Louisiana; those cuts came September 17, 2015, when NOLA Media Group fired 37 journalists, 28 of them full-time employees and nine part-timers. Hardest-hit were the Baton Rouge bureau, which had been expanded in the 2012 makeover, as well as The Times-Picayune's high school prep sports staff and its music reporting staff. The merged company was named Advance Media Southeast, registered in New Orleans. A facility to design and produce the pages of The Times-Picayune and four newspapers in Alabama and Mississippi—The Birmingham News, the Mobile Press-Register, The Huntsville Times, and The Mississippi Press in Pascagoula—was opened in January 2016 in a former suburban bureau of The Times-Picayune in Metairie, La., emptying the Howard Avenue building of the remaining staff. The Metairie building also houses Advance Central Services Southeast, formed from the combined Advance Central Services units in Louisiana and Alabama. Production of another Advance newspaper, The Oregonian, was moved to the Metairie location in late 2016. The Times-Picayune's first foray onto the internet came in 1995, with the www.New Orleans.net website. Among the website's features was the "Bourbocam", placed in the window of a French Quarter bar to broadcast images of Bourbon Street. During the 1996 Mardi Gras, it was one of the first internet webcams to carry a live news event. In early 1998, that site was superseded by www.nolalive.com, launched by Advance Publications Internet. The site's format was similar to other websites launched in connection with Advance newspapers in New Jersey; Cleveland, Ohio; Michigan; Oregon; and Alabama. Although nolalive.com was affiliated with The Times-Picayune and posted content created by the T-P newsroom, it was operated independently, and it also hosted blogs and forums. In early 2001, the site was renamed NOLA.com. After a management change at NOLA.com in February 2009, content on the website more closely reflected that of The Times-Picayune. Articles written for the newspaper were posted to the website using the Movable Type content management system. Led by Advance, the site underwent several redesigns over the years. On May 8, 2012, the site debuted its most dramatic redesign, by Mule Design Studio of San Francisco. With bright yellow accents, the design echoed that of Advance's bellwether site in Michigan, mlive.com. Following complaints from the public, NOLA.com developed a toned-down palette and new typography. However, the concept – a continually updated "river" of combined news, sports and entertainment content – remained the same. After the October 1, 2012, launch of NOLA Media Group, the publication workflow of the newspaper and website was reversed. All staff-produced content is published first to NOLA.com; content then is harvested from the website for publication in the printed Times-Picayune. NOLA.com also offers apps for mobile and tablet users; The Times-Picayune offers subscribers an e-edition only. The Times-Picayune was the longtime journalistic home of British-American satiric columnist James Gill, although he moved to The Advocate in 2013, along with many former Times-Picayune editorial staffers. For more than a decade, The Times-Picayune was also the newspaper home of Lolis Eric Elie who wrote a thrice weekly metro column, before he went on to write for television, most notably HBO's Treme and AMC's Hell on Wheels. William Hawthorn Lynch was an investigative journalist with the Times-Picayune's Baton Rouge bureau from 1979 until 1988, when he was named as the state's first inspector general, an office which investigates corruption, misuse of state equipment, and governmental inefficiencies. Lynch's colleague, Jack Wardlaw, another investigating journalist, was the Baton Rouge bureau chief from 1980 until his retirement in 2002. Patrick McCauley, the editor from 1966 to 1994 of The Huntsville Times in Huntsville, Alabama, worked for The Times-Picayune from 1960 to 1966; he was a Tulane graduate. It endorsed George W. Bush for President in 2000, but endorsed no Presidential candidate in 2004. In 2008 and 2012, the paper endorsed Democrat Barack Obama for President. It endorsed Democratic Party candidate Hillary Clinton in 2016. In gubernatorial contests it endorsed Mike Foster, Bobby Jindal, and David Vitter. In the mayoral race of 2006, The Times-Picayune endorsed right-leaning Democrat Ron Forman in the primary election and Lieutenant Governor Mitch Landrieu in the runoff. The Picayune endorsed Governor candidate Edwin Washington Edwards in 1971 and 1975, but went against him in 1983 (endorsing incumbent David C. Treen), 1987 (endorsing challenger and eventual winner Buddy Roemer) and 1991 (endorsed Roemer in the primary, but switched to Edwards in the general election due to Edwards' opponent being former Ku Klux Klan Grand Wizard David Duke). The T-P also stung Edwards in 1979 even though he was barred from running for a third term, refusing to endorse Edwards' hand-picked candidate, Louis Lambert, in favor of Treen both in the primary and general election. Since 1901, The Times Picayune has annually awarded a Loving cup to individuals who have contributed to improving life in the New Orleans area, through civic, cultural, social, or religious activities. Representative awardees include: Eleanor McMain, Albert W. Dent, Edgar B. Stern Sr, Scott Cowen, Gary Solomon Sr., Millie Charles, Mark Surprenant, Leah Chase, Norman Francis, Tommy Cvitanovich, Edith Stern, and Bill Goldring. Soon after The Times-Picayune was able to restart publication following Hurricane Katrina, the newspaper printed a strongly worded open letter to President George W. Bush in its September 4, 2005, edition, criticizing him for the federal government's response the disaster, and calling for the firing of Federal Emergency Management Agency (FEMA) chief Michael D. Brown. Brown tendered his resignation eight days later. The Times-Picayune long continued to editorialize on FEMA. A searing editorial on April 18, 2009, lambasted FEMA and labeled "insulting" the alleged "attitude" of its spokesman Andrew Thomas toward people who were cash-strapped after the evacuation from Hurricane Gustav, which in the meantime had become part of the melange of problems associated with hurricanes and governmental agencies. A second editorial on the same day blasted the State of Louisiana's Road Home program and its contractor ICF. The post-Katrina experience affected the paper's staff. On August 8, 2006, staff photographer John McCusker was arrested and hospitalized after he led police on a high-speed chase and then used his vehicle as a weapon, apparently hoping that they would kill him. McCusker was released from the hospital by mid-August, saying he could not recall the incident at all, which was apparently sparked by the failure to receive an insurance settlement for his damaged house. On December 13, 2007, Judge Camille Buras reduced the charges against McCusker to misdemeanors. The episode led to the establishment of a support fund for McCusker and for other Times-Picayune staff, which collected some $200,000 in a few days. In October 2006, columnist Chris Rose admitted to seeking treatment for clinical depression after a year of "crying jags" and other emotionally isolating behavior. ^ McLeary, Paul (September 12, 2005). "The Times-Picayune: How They Did It". Columbia Journalism Review. Retrieved May 27, 2008. ^ "Louisiana Leaders: Notable Women in History: Eliza Nicholson (Pearl Rivers)". Louisiana State University. Archived from the original on January 12, 2010. Retrieved September 22, 2010. ^ "Old Newspapers to Merge," NY Times, April 3, 1914. ^ "1980: New Orleans' two major newspapers merge". ^ "Times-Picayune" (search listing). Library of Congress Online Catalog. Retrieved May 3, 2006. ^ "Hurricane forces NO newspaper . .". ^ Nolan, Bruce (August 31, 2005). "The overview: 'Look, look man: It's gone'". The Times-Picayune. Archived from the original on September 30, 2007. Retrieved May 3, 2006. ^ Deutsch, Linda (January 16, 2006). "New Orleans 'Times-Picayune' Trying to Report, Survive". Editor & Publisher. Archived from the original on May 24, 2007. Retrieved May 3, 2006. ^ Hagey, Keach (May 24, 2012). "Times-Picayune of New Orleans No Longer a Daily". The Wall Street Journal. Retrieved May 24, 2012. ^ Carr, David. "New Orleans Paper Said to Face Deep Cuts and May Cut Back Publication". ^ Mirkinson, Jack (May 24, 2012). "New Orleans Times-Picayune Faces Deep Cuts, Will End Daily Publication". Huffington Post. Retrieved May 24, 2012. ^ "Times-Picayune Citizens' Group Speaks out on Proposed Changes to The Times-Picayune - Greater New Orleans, Inc. - Regional Economic Development". gnoinc.org. ^ Andrew Beaujon (April 30, 2013). "Times-Picayune plans new 'street' tabloid for previous non-print days". The Poynter Institute. Archived from the original on June 5, 2013. Retrieved June 5, 2013. ^ Amoss, Jim (June 24, 2013). "TP Street to land on newsstands Monday". The Times-Picayune. ^ "The Times-Picayune will home-deliver bonus Saturday and Monday newspapers to three-day subscribers during the fall". ^ Thompson, Richard (January 27, 2015). "Former landmark Times-Picayune building sold to local group for $3.5 million". The Advocate. Retrieved November 28, 2018. ^ "T-P Ends Local Printing". Archived from the original on January 21, 2016. Retrieved January 18, 2016. ^ Ted Griggs (January 27, 2015). "The Advocate overtakes The Times-Picayune as Louisiana's largest newspaper". The Advocate. Retrieved November 28, 2018. ^ "Mathews to lead new company overseeing NOLA Media Group and Alabama Media Group; Francis named NOLA - TP publisher". ^ Allman, Kevin. "More staff cuts ahead for NOLA.com - The Times-Picayune". ^ Allman, Kevin. "More layoffs at NOLA.com - The Times-Picayune". ^ "NOLA Media Group will open Baton Rouge office, expand reporting and sales staffs". ^ Richard Thompson (September 26, 2015). "Times-Picayune lays off 37 journalists in latest shakeup; New Orleans Advocate says it's expanding its staff". The Advocate. Retrieved November 28, 2018. ^ "Times-Picayune Abandons Music Journalism". ^ "State of the art print lab in New Orleans to produce 5 regional newspapers including The Times-Picayune". ^ "Times-Picayune design and production move into new Print Lab". ^ "The Oregonian Will Outsource Some Copy Editing and Production Work to New Orleans". ^ "A New Orleans.net: Destination New Orleans". November 12, 1996. ^ Gray, Chris (January 7, 1996). "TP ushers in New N.O. Web page". ^ "Cats Meow reopening a sign of Mardi Gras". ^ "About the new NOLA.com homepage - NOLA.com". May 11, 2012. ^ "It's official: America hates Advance's news sites". July 13, 2012. ^ "Read about the new look of the NOLA.com home page". ^ ""NOLA: Apps"". Archived from the original on September 5, 2015. Retrieved July 26, 2015. ^ "About Bob Mann". bobmannblog.com. Retrieved October 18, 2013. ^ Emily Featherston (May 5, 2015). "Patrick McCauley". The Alabama Press Association. Retrieved May 17, 2015. ^ "Barack Obama for president". The Times-Picayune. Retrieved November 15, 2008. ^ "Read The Times-Picayune's 2016 election endorsements". ^ "The 2006 Pulitzer Prize Winners Breaking News Reporting". The Pulitzer Prizes. Retrieved June 28, 2012. ^ Schute, Michael. "The eyes of a hurricane". rowanmagazine.com. Archived from the original on November 9, 2013. Retrieved June 28, 2012. ^ "The Times-Picayune Loving Cup Nominations". The New Orleans Times-Picayune. January 15, 2016. Retrieved October 2, 2016. ^ A new start at FEMA, Archived June 4, 2011, at the Wayback Machine Times-Picayune, April 14, 2009, Saint Tammany Edition, p. B4. ^ FEMA unlikely to pay for hotels during Gustav on Homeland1.com. ^ "Let them eat MREs". www.nola.com. The Times-Picayune. April 18, 2009. Archived from the original on April 20, 2009. ^ Sisco, Annette (April 18, 2009). "Gov. Jindal's administration must fix the other Road Home mess". The Times-Picayune (Saint Tammany ed.). New Orleans, LA: nola.com. p. B4 (editorials). Retrieved March 5, 2018. ^ Daryl Lang (August 9, 2006). "Suicidal New Orleans Times-Picayune Photographer Arrested". Photo District News. Archived from the original on May 22, 2008. Retrieved October 22, 2006. ^ Daryl Lang (August 17, 2006). "Times-Picayune Photographer John McCusker Out Of Hospital". Photo District News. Archived from the original on November 7, 2007. Retrieved October 22, 2006. ^ "Hell and Back". New Orleans Times-Picayune. October 22, 2006. Archived from the original on January 6, 2007. Retrieved October 22, 2006. Wikimedia Commons has media related to The Times-Picayune.